China is a big place but with its huge population (1.4 billion) mostly gathered in urban environments, space is becoming more of a commodity. 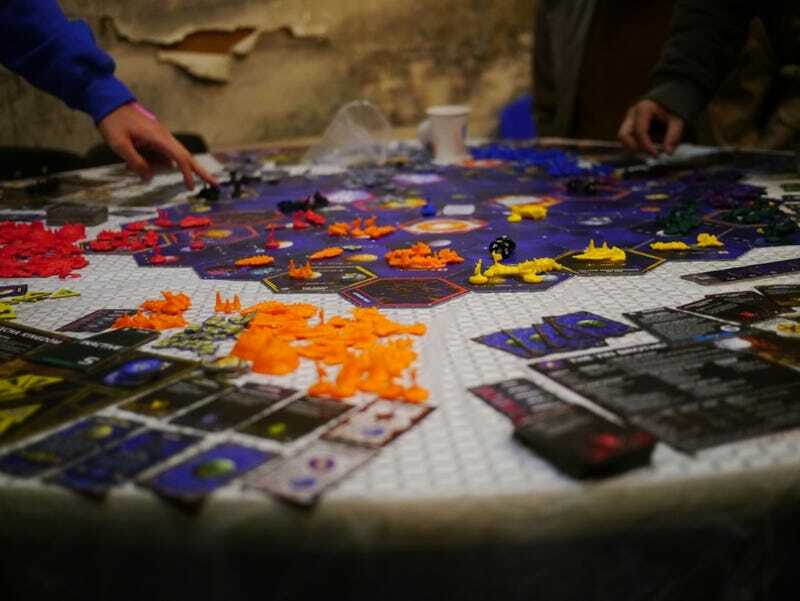 Grown from this need for space, "board game cafes" began to spring out in major cities much like internet cafes did. In early 2010 a new trend broke out in China, stealing the thunder of internet cafes. Springing up overnight, "board game cafes" became a thing. Internet cafes can be said to have served the needs of Chinese gamers without access to a good PC or to a stable and fast internet connection. Board Game Cafes grew from a need to get out of one's home and socialize, and a need for space for people to gather to play games. These gaming cafes grew and grew in popularity and became huge in China; soon enough there were "zhuoyou ba"-s literally everywhere. These places were often filled with uncomfortable couches and overpriced food. The one good thing they had was big tables and lots of board games, from everything such as Call of Cthulhu and Three Kingdoms Killers to Monopoly. Unfortunately, these locations were businesses and not real cafes that served the needs of table top gamers. They did business by the volume; the whole purpose was to get gamers in and get them out in record time. They also charged by the hour like an internet cafe. The average pricing in Beijing is about 10 RMB per person, per hour (about $1.60) on the weekdays and about $5 an hour on the weekends. Beijing gaming fixture Dan Bass says that another reason for the growth of gaming cafes was that people wanted more face to face interaction time. Bass, who recently helped launched Beijing and China's first tabletop/role-playing gathering, Khan-Con, also ran the now defunct Beijing D&D Cafe. The business really boomed in late 2011 with loads of cafes popping up everywhere, but now it seems that tabletop gamers aren't as happy with the business model any more. At least according to People's Daily, the Party newspaper of China, at least half of the stores that opened for business in Shanghai have gone the way the way of the dodo bird.